But, mostly, Mud & Rain. The union of mud and rain creates an opportunity to sort through recordings from the last 3 years(2008-10) and assemble a compilation featuring songs, poems & outtakes that fell into the ‘things to sort’ pile. And sorting through recordings is a pleasant reminder how the past is never far and the future is not what it used to be. Officially, this is the 23rd ‘rainbow family circus & tribal zoo’ CD compilation. 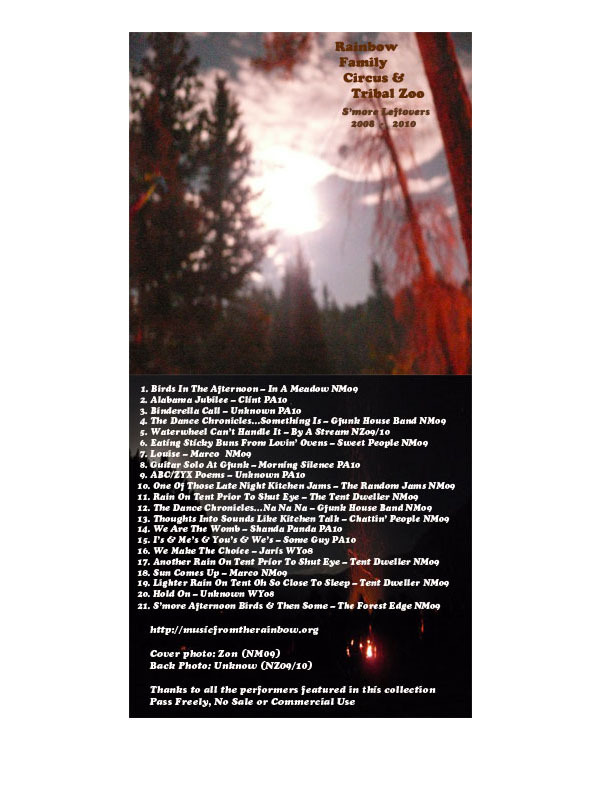 It includes 22 songs, poems and outtakes culled from the shadows of the 2008 Wyoming, 2009 New Mexico, 2009/10 New Zealand, & 2010 Pennsylvania rainbow gatherings. There are several golden gems that lay dormant until now. May they carry you into the seasons ahead. As always, enjoy the music, and Pass Freely, No Sale or Commercial Use.